This week's guest didn't just change the path of popular music, he took it to a far-out cosmic dimension. 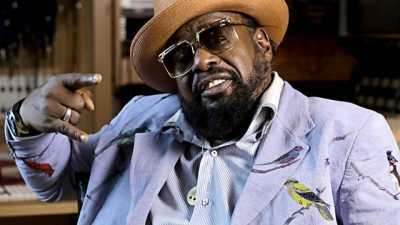 As the driving creative force behind legendary 70s bands Parliament and Funkadelic George Clinton revolutionized soul and funk music, leading it into some insanely creative and psychedelic territories. A huge and undeniable impact on artists like Prince, Red Hot Chili Peppers, Erica Badu, Kanye West, Snoop Dogg Dr. Dre and OutKast, his music is as thrilling as ever, and he remains the most sampled man in the history of music. Here George talks about his youth in do-wop bands, working at both Motown and as a songwriter in the legendary Brill Building, and how he took his humble soul band The Parliaments and developed them into a multi-coloured, platinum selling, virtuoso, psychedelic funk rock collective. As someone who changes what was possible at live music shows, he also discusses 'The Mothership' the iconic UFO stage set that used to land at Parliament and Funkadelic gigs. He also talks about the serious battle with drug abuse that stunted his career in the 80s and 90s, getting clean and his musical comeback, and on-going legal crusade to see musicians get recognised and receive royalties for their work being sampled - a battle that has taken him to the federal courts in Washington.